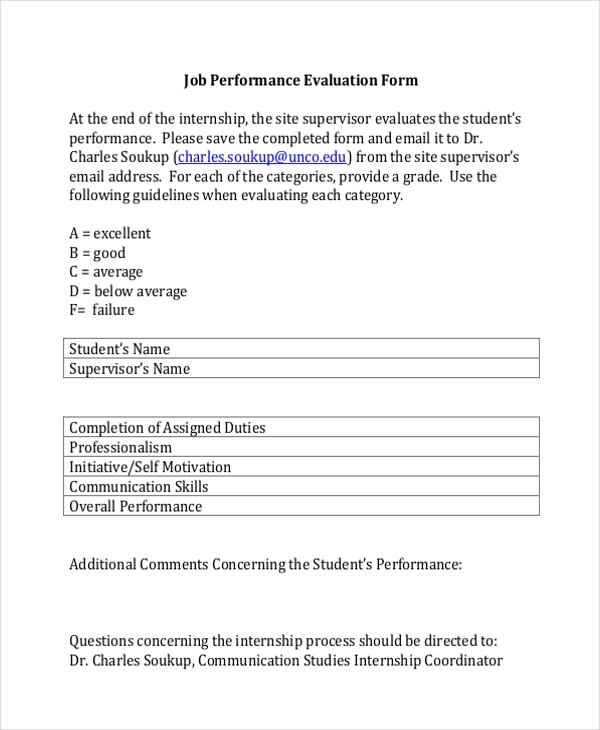 This is a standard design of a job performance evaluation form and gives you an idea about its format and the essential segments that should be included in it. Of course, you can add your own personal touch to this form. This is a sample of a traditional job performance evaluation form and consists of all the segments that should be present in such a form. A user can use this form just as it is or make changes to it as per his requirement. 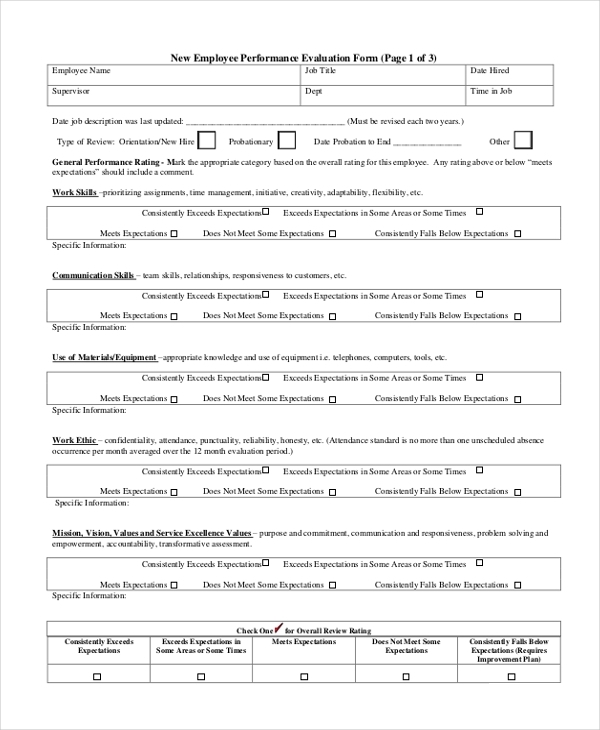 Used by the supervisors and managers of an organization, this form enables them to report the performance of their subordinates to the higher official in the company. They may use this form to evaluate the employee performance at any time. 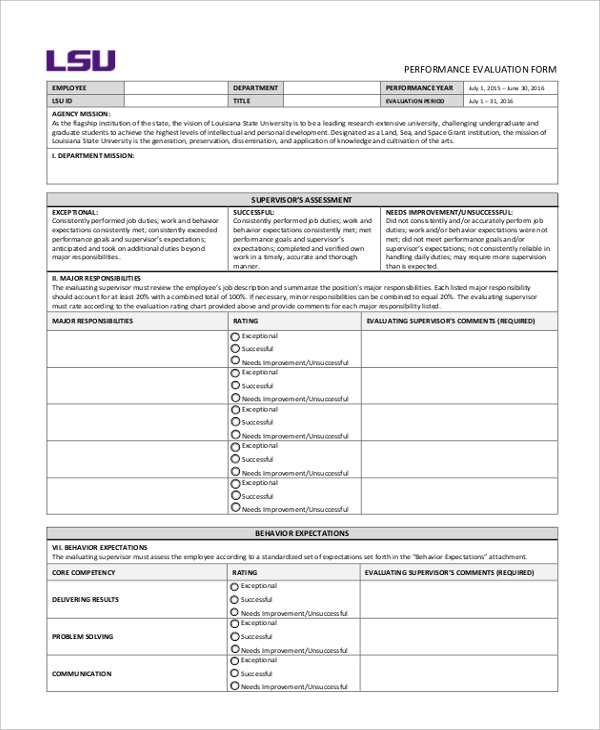 This form is used by a company or an organization to evaluate the performance of its employees over the course of a financial year. It is on the basis of this form, that the employees’ performance and commission is decided. 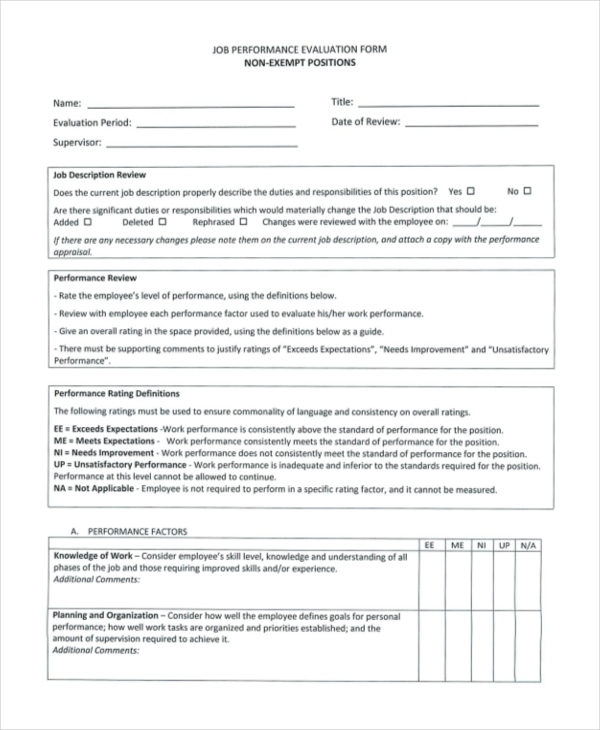 This job performance evaluation form is used by a company or office to assess the performance of its staff members. The immediate bosses of these employees are required to fill this form and then share it with the higher officials. 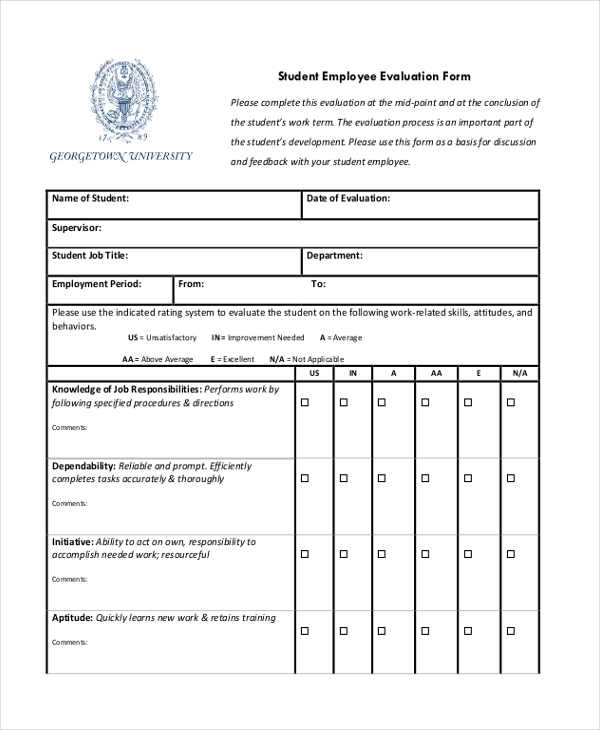 This form is usually used by the supervisors and managers of the firm to evaluate the performance of the student who may have worked on internship in the company. Based on the form details, the company grants the student an experience certificate and credentials. This form is mainly used to assess and evaluate the job performance of employees who work at the tail end in a firm. The form is filled by their bosses and submitted to the higher officials to inform them about the abilities of these employees. As the name indicates, this form is used to evaluate the job performance of a new employee who may be on probation in a company. Based on this analysis, the management may decide if the employee should be made permanent. This form is used in an organization to review the performance of an employee over a period of time. It is based on the data provided in this form that the organization decides a future course of action for the employee. As is quite obvious from the name, this form is used by the human resource department of a company to evaluate the performance of an employee. It is based on this analysis that an employee is offered an increment or performance bonus. Who are the Target Audience for Job Performance Evaluation Form? 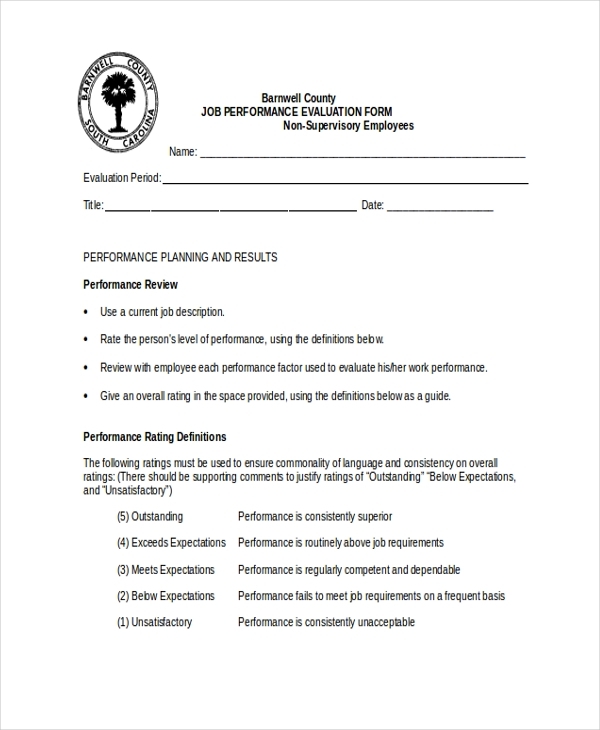 A job performance evaluation form is mainly used to gauge the performance of an employee or trainee over a specific period of time. Thus, this form is mainly used by business organizations and companies who need to keep a close eye on how their employees perform their duties and how efficient they are with these. It is also used by the HR department of a company to assess the increment, commission and bonus that an employee may be liable to at the end of a financial year. What are the Benefits of Using a Job Performance Evaluation Form? 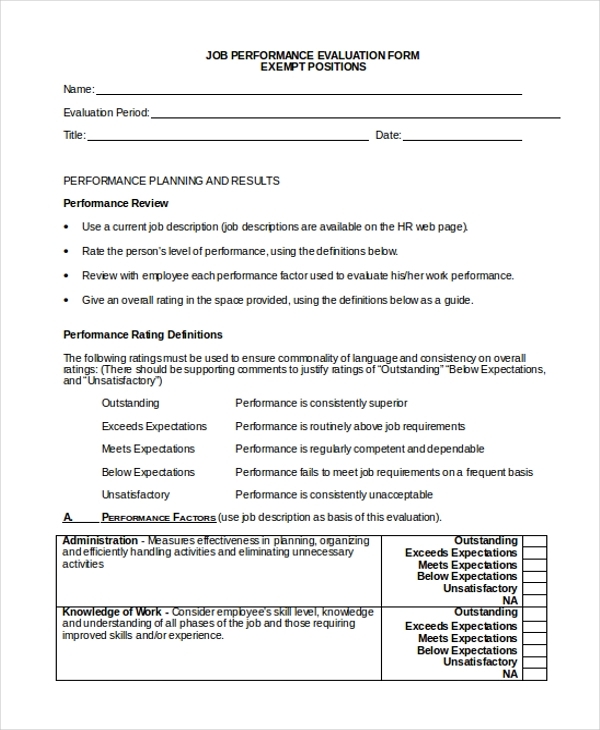 What Things Should You keep in Mind When Designing a Job Performance Evaluation Form? If you want the job performance evaluation process to be an efficient one, you need to make sure that the questions you frame help in getting the maximum information. In case, you are not sure how to do this, do not fret. 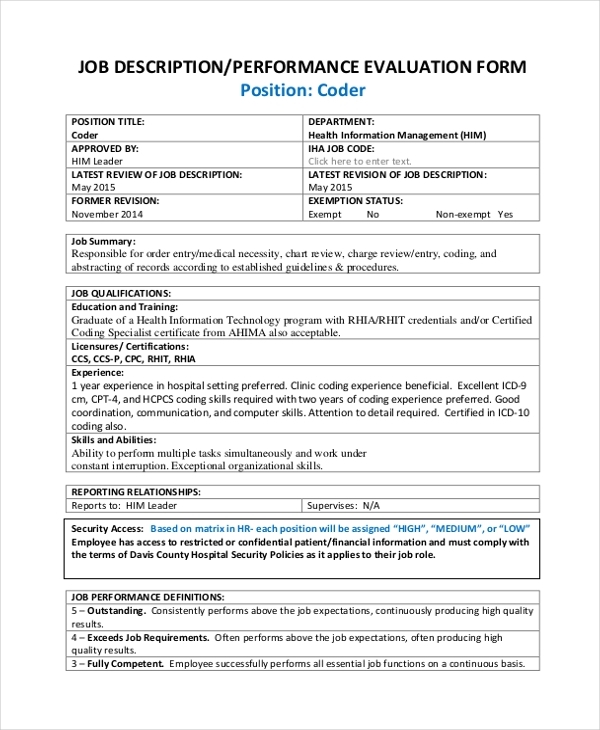 Just look for the perfect job performance evaluation form from the wide selection available online. These forms are easy to customize and would serve your purpose correctly.